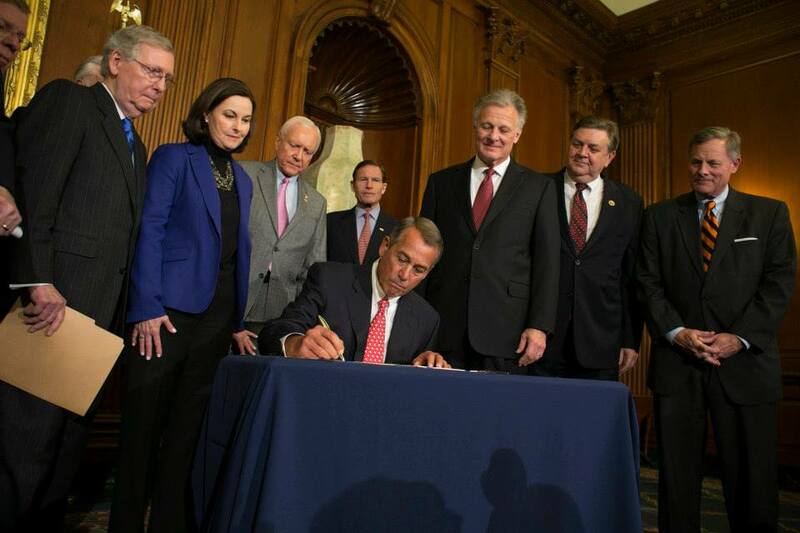 Washington D.C. (February 10, 2015) – This evening House Speaker John Boehner (R-Ohio) signed the Clay Hunt Suicide Prevention for American Veterans (SAV) Act certifying its passage during an enrollment ceremony. The Speaker was joined by Susan and Richard Selke, parents of Clay Hunt, Paul Rieckhoff, IAVA CEO and Founder, and IAVA member veterans who were present for the ceremony. The Clay Hunt SAV Act, which passed the House in January and the Senate unanimously last week, will combat veteran suicide and improve access to mental health care. The legislation is named after Marine sniper Clay Hunt from Texas, who died by suicide in 2011. Iraq and Afghanistan Veterans of America (IAVA) commends Congress for standing with our veterans and passing the bipartisan bill. The bill now goes to President Obama, who will sign it into law on Thursday, February 12, 2015. Click here to visit a timeline of IAVA’s work on combating suicide. · Requires the VA to create a one-stop, interactive website to serve as a centralized source of information regarding all VA mental health services for veterans. · Addresses the shortage of mental health care professionals by authorizing the VA to conduct a student loan repayment pilot program aimed at recruiting and retaining psychiatrists. · Extends Combat-Eligibility for mental health care services at VA for one-year, providing for increased access for veterans that may be suffering from conditions such as Post Traumatic Stress Disorder (PTSD). · Requires evaluations of all mental health care and suicide prevention practices and programs at the VA to find out what’s working and what’s not working and make recommendations to improve care. · Establishes a peer support and community outreach pilot program to assist transitioning servicemembers with accessing VA mental health care services.